I’m a realist, too. As we come to the end of 2015 and embrace a New Year, real­ity looks good to me. There’s no ques­tion our industry faces challenges in the days ahead and we can’t shirk from those realities, but here are ten reasons to celebrate OOH. OOH is the second fastest growth medium following digital (online, social, and mobile) with gains projected through the next three years, according to ZenithOptimedia. Next year, ZenithOptimedia expects US OOH to grow 4 percent, and con­tinue that pace through 2017. OOH will continue to be the top performing form of traditional media, and outpace total combined media through 2017 even af­ter accounting for digital (online, social, and mobile). 2) OOH Growth is Global. The Austra­lian OOH industry is up dramatically with double-digit growth. Alan Brydon, the new leader of the UK OOH indus­try group, Outsmart, says the most prevalent theme in the UK is “positivity.” According to Magna Global, OOH will grow globally by 5.2 percent next year compared to 4.3 percent for total combined media. The overall message is that OOH continues to perform well everywhere. 3) Broadcast is Down; Print is Worse. 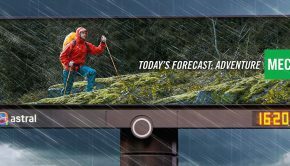 A weakening in other media channels signals an opportunity for OOH. Global TV ad spend will fall this year, for the first time in a non-recession year. In the US, TV spend will be down 3.9 percent. Nielsen recently admitted, the smart phone is eating TV spend. TV viewing by all age groups peaked in the 2010 season and has been declining ever since. Before that point, TV viewing had been growing since 1949. Of course, TV’s revenue will be sus­tained somewhat in 2016 with the cycli­cal infusion of presidential election and Summer Olympics media spend. The downward spiral of print will con­tinue. Newspapers will be down 12.9 percent this year and magazines will be down 13.5 percent. Radio will be down 3 percent. The TAB Board of Directors has just agreed to test an am­bitious proposal intended to enrich and expand the information derived through OOH ratings. The plan will produce enhanced audience measurement using a blend of standardized sources for ve­hicular traffic data, augmented through multiple data sources. The information will cover millions of miles of roadways, include volume and congestion by time of day, and vehicular occupancy. Further enhancements are expected to include the measure of pedestrian volume, new eye tracking research, and advanced audience profiling in an effort to produce more timely metrics for an expanded universe of OOH formats. The OOH industry’s Feel the Real campaign landed big on the press radar screen, starting with an ex­clusive in The Wall Street Journal during Advertising Week in New York. Equally important, media planners noticed the hyper-targeted OOH ads, and their responses lit up social media. 6) Digital Ad Spend Will Soon Overtake TV and That Helps OOH. The Wall Street Jour­nal recently reported that digital ad spend in the US will surpass TV spending next year. Digital will be the largest media category with revenue expected to exceed $66 billion. 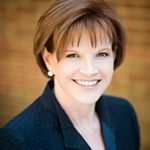 The OOH medium complements digital media. 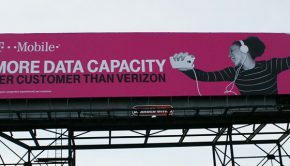 In fact, MediaDailyNews writes, “Today, OOH is increasingly becoming the media of choice of public brand declarations. The public plus private formula is tried and true and an effective mode of communication.” But, instead of using TV and print to deliver this combination, more marketers are turning to digital and OOH. Ford is asking consumers to design custom OOH ads, taking “brand connections” to a new level. In five UK markets, Santa Claus made his rounds on 50 digital billboards. London is displaying traffic updates on digital taxi tops. Advances in display technology and data integration are combining to make OOH an even more compelling design palette for brands. The result is a new gen­eration of OOH design options that can engage consumers like never before. Los Angeles Mayor Eric Garcetti says waiting for the bus should be “an oppor­tunity, not a chore,” thanks to upgraded bus shelters and benches. Municipalities are beginning to see more dimensions to the traditionally linear role of the OOH medium with new amenities and revenue streams. When the intelli­gent and intuitive nature of a connected web is linked to the physical world, it positively impacts cities and makes them better places to live. OOH helps to make the connections. 9) The Industry Maintains Strong Relationships with Congress. President Obama just signed a five-year Highway Bill to maintain roads, bridges, and tran­sit while protecting OOH industry proper­ty rights. Despite attempts to inject two amendments to the Bill that could have harmed OOH, our industry responded with deliberate action and the amend­ments were defeated. The OOH industry has a long history of working with elected officials to ensure that our right to con­duct business is preserved while re­maining a positive economic driver and job creator in communities across the country. 10) More Brands Recognize the Power of OOH. 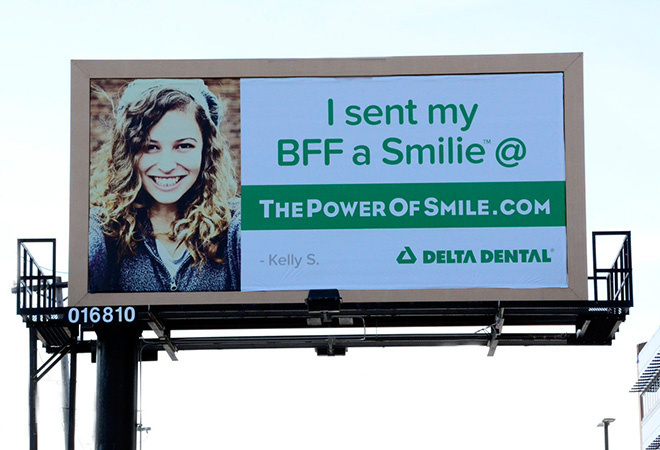 In Minneapo­lis-St. Paul, a 12-week campaign boosted enrollments by 92 per­cent for Delta Dental of Minnesota, driving con­sumers to a website to browse dental plans. Digital billboards were supported by bus kings, train wraps, posters, and bulletins. This highly engaging campaign won OAAA’s 2015 OOH Media Plan of the Year Award. Local businesses and national brands rely on OOH to deliver messages to active audiences when they are away from home on the path to purchase. 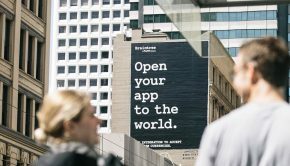 The brands using OOH straddle every product category, but some of the most striking growth has been among technol­ogy advertisers. 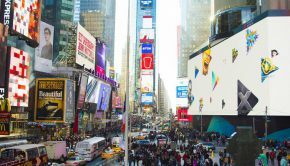 Apple, Google, Sam­sung, Snapchat, and Spotify are among the brands investing more heavily in the power of OOH. Yes, I am a realist, a realist who can­not ignore facts. OOH is a growing and vibrant media channel with much to celebrate as we ring in a New Year.